Abbey Consort is a small choir of around 24 members. We all live in the Scottish Borders and the choir is based in Kelso. 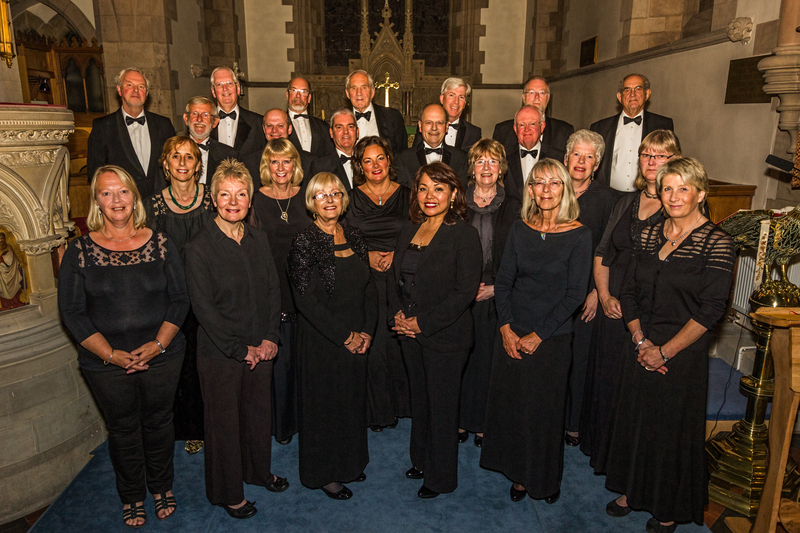 Formed in 2002, Abbey Consort was under the musical direction of Colin Fox until December 2014. Jim Letham, one of our choir members, took over immediately thereafter as Musical Director. We have performed many works from the baroque and classical choral repertoire. See the Works page for more details. On occasion we have performed with other choirs including the Roxburgh Singers, the Eildon Singers and the Berwick Arts Choir. Our soloists are often drawn from within the choir itself but we have also invited many well-known soloists to sing with us. All of our concerts are accompanied by an orchestra composed of some of the many talented musicians who live in the Scottish Borders. Abbey Consort is a non profit-making organisation and we have been happy to donate proceeds from our concerts to a range of very deserving causes. We also perform as a smaller group at weddings, funerals and other occasions. 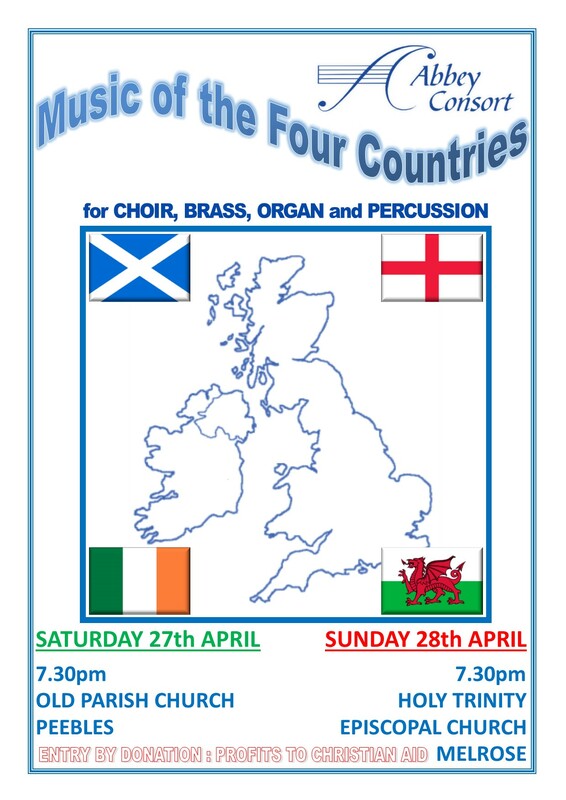 The concert programme ‘Music of the four countries’ brings together a wide variety of musical styles – from sacred to secular, from Shakespeare to Burns, from Victorian to contemporary. The composers of the pieces are from the four countries of the British Isles and encompass the years from 1850 to the present date. Many of the composers are interlinked either as teacher/pupil or as friends or as contemporaries in an era of hugely changing musical styles. The first half of the concert offers a selection of sacred music which is, largely, 20th century in origin. The hauntingly beautiful a capella singing of Stanford’s Beati quorum via and Justorum animae are contrasted by the exuberance of Rutter’s Gloria with its heavy reliance on brass accompaniment. Matthias’ Let the people praise Thee was written for the 1981 wedding of the Prince of Wales and Lady Diana Spencer and is a choral fanfare. Hallelujah, composed by our musical Director, Jim Letham, was written for the 60th anniversary of the Dunbar and District Choral Society and is a Scots version of psalm 150. O clap your hands is a motet by Ralph Vaughan Williams. He composed the anthem, a setting of verses from Psalm 47, in 1920 for a four-part choir, organ, brass, and percussion. He later also made versions for orchestra and for organ. The organ solo, Master Tallis’s Testament was written by Herbert Howells as part of a group of six pieces. This particular piece was influenced by Vaughan Williams’ Fantasia on a Theme by Thomas Tallis and it was intended as a tribute to Vaughan Williams. The second half of the concert is mostly secular music. Holst wrote the music for the two pieces on the programme for a separate composition, his 2nd suite if F for military band. The words for I love my love come from a Cornish folksong which tells the story of how love and patience overcomes barriers. The song of the blacksmith is a Hampshire folksong which tells how a blacksmith wooed his lady with the supporting voices representing the sound of his hammer in the forge. Sullivan’s The long day closes is his best known part song which has become a favourite performed at events of mourning. Let me the Cannikin clink is a faux drinking song which appears in Shakespeare’s Othello. It is sung by Iago to lure his enemy Cassio into thinking that Iago and his men were harmless drunks. McKenzie wrote a cantata based on Burns’ poem The Cotter’s Saturday night which gives a description of country life and its simplicity. O Scotia is the end portion of that cantata. Sir Walter Scott’s poem, The Lay of the last Minstrel, is the inspiration for McCunn’s 1888 cantata from which O Caledonia is the concluding part. Chris Achenbach, our organist for this concert, wrote the piece Toccata which is based on the Sussex Carol – On Cristmas night all Christians sing. The finale of the concert is Parry’s stirring version of the traditional coronation anthem, I was glad, which he wrote in 1902 for the coronation of King Edward VII. The words are taken from psalm 122. If you would like to contact Abbey Consort please use any of the methods below. 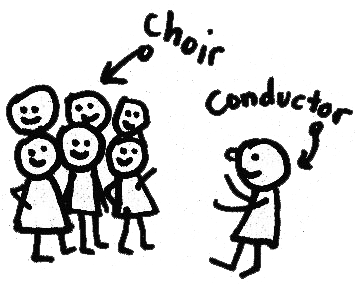 We are happy to hear from budding choristers, particularly basses at present. We would invite you along to a rehearsal with a short audition, more information will be given once we hear from you. Alternatively please complete the following details and click Submit.